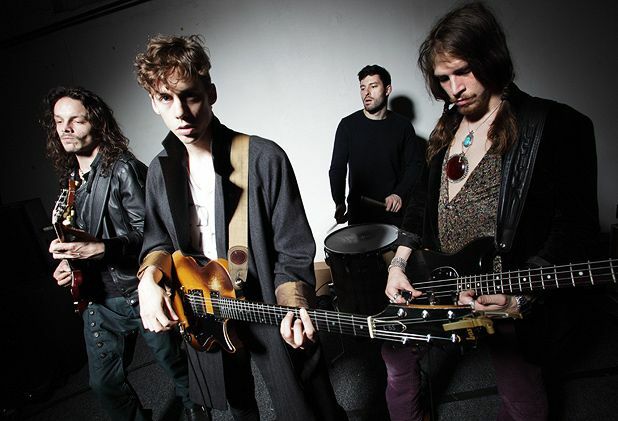 Razorlight are a band with a chequered history. Undeniably, they’ve been a big success in their day: three top five albums and five top ten singles since 2004 testify to that, including the undeniably hook-laden likes of ‘America’ and ‘Somewhere Else’. Yet their lead singer, Johnny Borrell, Camdenite scenester and tabloid cannon fodder par excellence, was always a villain-in-waiting, not least for annoying and unwanted statements – like the time he proclaimed himself a genius. So now his band are back with no original members in tow, we can’t wait to see him fail. Right? Low-key shows like this, if the HMV Picture House can be described as such, are a prelude to bigger festival sets in the summer. ‘We’ve been working on new songs, too,’ says Skully. ‘We have about 22 we’re recording just now, and then we should have a new album out later in the year.’ For his sake, we hope bygones are bygones. Razorlight will be headlining at Haddow fest, which takes place at various venues around Edinburgh on Saturday 2 & Sunday 3 April. New line-up for Jonny Borrell's indie rockers as they play Haddowfest, please note new venue.